If the service in a restaurant or hotel is good, then I generally tip - sometimes cash, but on other occasions I just add a gratuity to the credit card bill. But where does my tip go? I've often asked myself whether my tip goes to the waiter who has provide the quality service or if it is shared out among all the staff, including those working in the kitchen. Heaven forbid that the restaurant owner pockets it! This week I was interested to read a press report in the Daily Telegraph that tried to answer my questions. I thought I would share their findings with readers. Well, according to the paper's researcher, that gratuity you added to the bill in a haze of generosity and bonhomie might not go straight to the person who brought you your food. The world of restaurant tipping is a lot more complicated than that! So where does your tip go? It all depends where you're eating. In many of the big chains, the company will deduct a percentage of that service charge added onto the bill to cover what they call "admin costs". At Pizza Express, for example, with 430 outlets across the country, 8 per cent of that credit card tip is taken by the company - allowing the firm to keep a total of £1m a year, according to the Unite union, which represents waiting staff. But there are others chains that deduct even more: Giraffe takes off 10 per cent, as does Café Rouge. 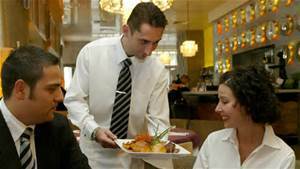 However upmarket London restaurant group Caprice Holdings - whose portfolio includes The Ivy - says at their establishments "all of the service charge is distributed to employees of the restaurant". Are smaller independent restaurants any fairer? Well according to the Telegraph, there are plenty of examples of good practice out there. At south London restaurants The Dairy and The Manor, manager Dan Joines says all the money from service charges or tips goes straight to staff. They divide up cash tips among themselves - to both front of house and kitchen staff, while service paid on a credit card goes into a more formal system called a tronc: a sort of communal kitty. It's distributed by a nominated employee, into monthly pay packets. "In order to give all of the tronc to staff, both the restaurant director and myself are not on the payroll and don't take any of the service charge in any way", says Dan. 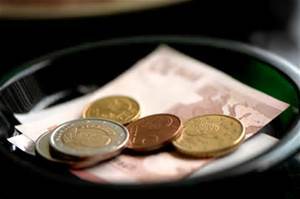 Can the service charge used to top up wages? Not any more. 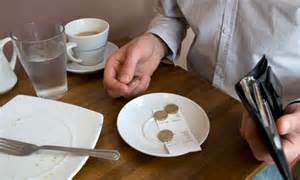 The law was changed in 2009 after a campaign exposed a legal loophole which allowed restaurants to use the service charge to form part of basic pay. Nowadays everyone must be paid at least the minimum wage and there's a voluntary code of practice to cover how customer tips should be shared out. But remember that waiting tables is still one of the lowest paid jobs in the country. How is the money shared out? It all depends on the establishment. 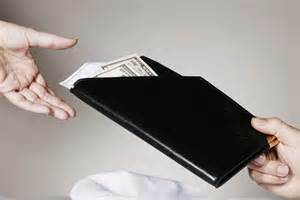 Cash is often divided up informally - and like any other gratuity, is liable for tax in the normal way. If there's a tronc system, restaurants may have a policy to decide how much goes to front and back of house. At Pizza Express, after they've taken their 8 per cent 'admin charge' - the rest is split 70:30 between your waiter and the kitchen team. What if there isn't a discretionary service charge? Some places have made a deliberate decision to leave the tip up to customers - like the United States, where it's common to leave up to 20 per cent if the food and service were good. Oisin Rogers, who manages a large Young's pub, says he's happy to leave it up to customers - apart from large tables of eight or more, who can rack up bills of £1,000 at Christmas yet leave just a couple of £10 notes on the table for service. "All gratuities are paid to the staff through the payroll as extra income on top of their pay, and it's taxed as normal." But what if you didn't like the food and service can you refuse to pay a tip? According to Rogers, "If a customer was not happy for any reason, we would not think twice about removing service charge or discounting the bill. It would be immediately deducted from the bill as policy." And according to the consumer association, Which, you are within your rights to refuse to pay a service charge - even if it's not described as "discretionary". But you can't simply walk out without paying for the food. Finally, it seems to me that it might be better to leave cash. Am I right? Yes, says the Unite union. 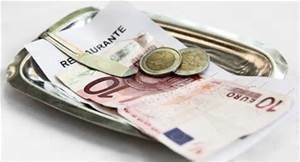 If you don't know whether you're eating at one of the places which skims a percentage of credit card tips, leaving cash means the whole amount will go to the staff. And although they'll still have to pay tax on them they aren't liable for National Insurance. So, if you've enjoyed your meal and the service, show your appreciation in cash.